It was recently reported that the difference between working class and upper class is whether the evening meal you were brought up with was ‘tea’ or ‘supper’. Your nominal class apparently has some bearing on the successes you are likely to achieve later in life. The TVR fraternity has eschewed this notion - TVRs were cited as being the supercar for the masses. 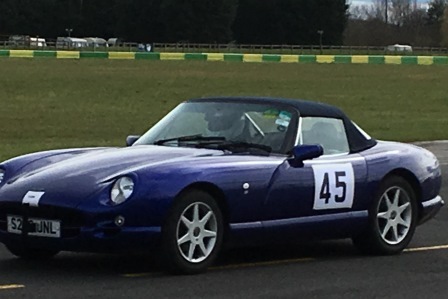 ‘Class’ doesn’t define TVR ownership as it does for say, Italian or German sportscars, as demonstrated by the range of backgrounds of previous Speed Championship champions (farmer, nursery teacher, solicitor, builder, importer). 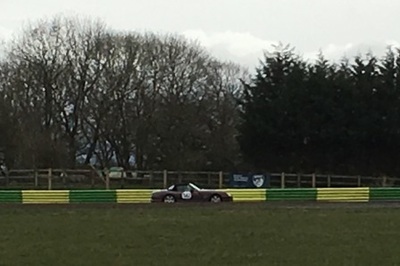 The organisers at Croft always put on a top class event. The only hiccup this year was when their good intentions entirely backfired – the road sweeping truck used to clear the road of debris and to some degree water, decided it was full just as it approached the first corner, and dumped its contents all over the critical braking zone. As the bleary-eyed competitors looked on in horror, the road sweeper swiftly disappeared, seemingly to avoid being lynched. After 15 minutes of absence, the now-restored road sweeper re-appeared, and duly set about clearing up the mess. Practice beckoned, and paying little attention to the numbers allocated to the cars, the paddock marshal called the batches forward according to some random ‘class’ structure. “Can we have cars in classes four and five to the start line,” was closely followed by “Can we have class three now please”. 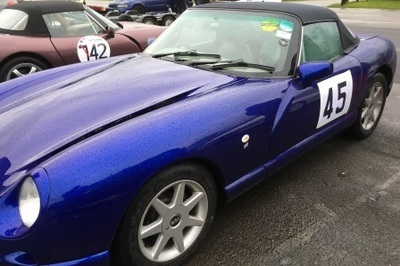 Then our turn along with our Malvern cousins, both without a class number: “Can we have the Morgans and the TVRs next”. 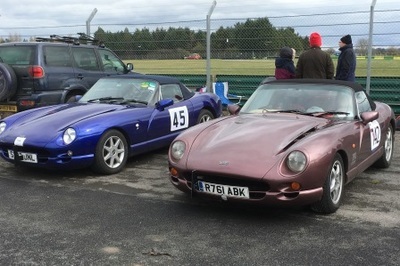 It would probably be unfair to classify the owners of these two marques in the same echelons; maybe Morgan drivers are ‘classless’ and us Tivvers ‘have no class’? 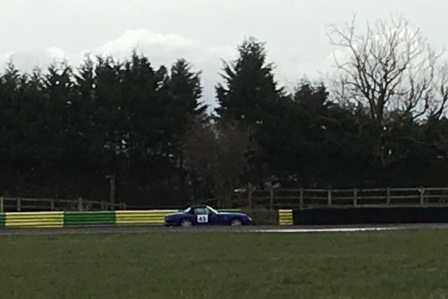 In a wet first practice, the Porsche drivers were trying unsuccessfully to dismiss the idea that the nouveau riche are actually lower class, with three out of the first four competitors spinning in the first two bends. In contrast, all the Tivvers got round unscathed, albeit 30 seconds slower than last year’s dry times. Welcome support for this event came from Peter Caygill (Tees Valley) who stood behind a camera all day, and Max Unwin and Tony Hodgson (South Yorkshire) who had driven from a very wet Sheffield to enjoy the ‘improving conditions’ in this delightful corner of the British Isles. The track got drier and drier during the day, thanks in part to clearing skies, but mostly due to force 5 winds blowing across the circuit. Positions remained constant throughout the day: Cole-Briars-Hunter-Lynch; and as the grip increased, everyone’s times came down, with everyone improving by over 20 seconds from P1 to T2. 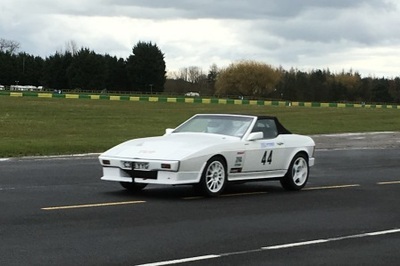 Simon held his own on four-year-old 1B tyres against the Rainsport-shod Hunter-Briars car in the initial wet conditions, and ran away with the event in the final, virtually dry, run. Mr Cole proving yet again that he is in a class of his own. For the rest of us, a long journey home for tea!